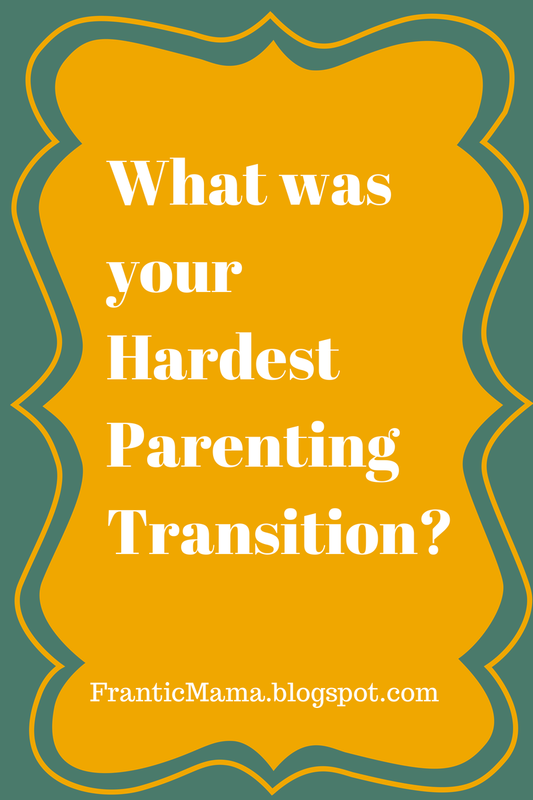 Frantic Mama: What was your Hardest Parenting Transition? My husband and I occasionally talk about what we think was the harder transition: Going from 0 to 1 child, or going from 1 to 2 children. We agree that 0 to 1 was the hardest. Your entire life changes when you bring your first baby home, and it took us a while to truly wrap our heads around that idea. When I was pregnant with my son, I had this vague notion that I would be tired and busy once baby arrived, and that I would go out at night a little less (Ha! ), but it was impossible for me to see much beyond the new crib, the rocking chair, the tiny clothes, and the excitement of a new huggable, lovable baby. I think in part that kind of rose-colored view of motherhood must be biological. If we knew just how hard it was going to be, would the human race even really continue? Just kidding [kind of]. When we had our daughter, our second baby, the hardest part emotionally for me was still trying to connect with my sensitive son (who was 27 months old) as much as I could, despite recovering from surgery and the typical new-mom exhaustion. I had heard too many stories about the older child being sad when a new baby 'steals' the parents' attention. I just couldn't bear it. I missed my son while I was in the hospital having my daughter, in that weepy, overwhelmed, hormonal way many women feel postpartum. It was also quite terrifying the first day (and many days after that) when my husband left for work after his puny one week off, and I had to face being home all day with TWO tiny, needy people in my care. Now that my son is 4 and my daughter will be 2 soon, there are definitely moments-- a lot-- when I feel physically and emotionally pulled in both directions. My anxiety can spike when I realize, again, at 6:30 a.m. that my day will revolve around their needs. However, here's the rainbow: they are also getting old enough where I make a point of explaining that mommy has needs too-- eating, going to the bathroom, even making a phone call. I'm not sure I did that when I had only my son. But it is a good lesson for them to learn, isn't it? That women have needs and we need to respect that? Perhaps it is a necessary, hard-earned lesson we learn once we have more than one child. I can't speak for going from 2 to 3 (or 3-4, etc. ), of course; I have heard mixed feelings about the transition of adding more children to the family. Some have said that adding a 3rd is the easiest transition, and for others, it is clearly the hardest. What do you think? What was your hardest transition as a parent? Did you change your parenting with each child you welcomed into your family? You can find more of my work on: Mamalode and Felicity Huffman's What the Flicka?